About a month after the release of v0.4.0, the v0.5.0 is already out! Well, ‘already out’ is maybe too much: there are few functional changes, but a major step forward for French translation. Loading a new translation in KooZic is a piece of cake. However, you might have noticed that the interface is partially translated. 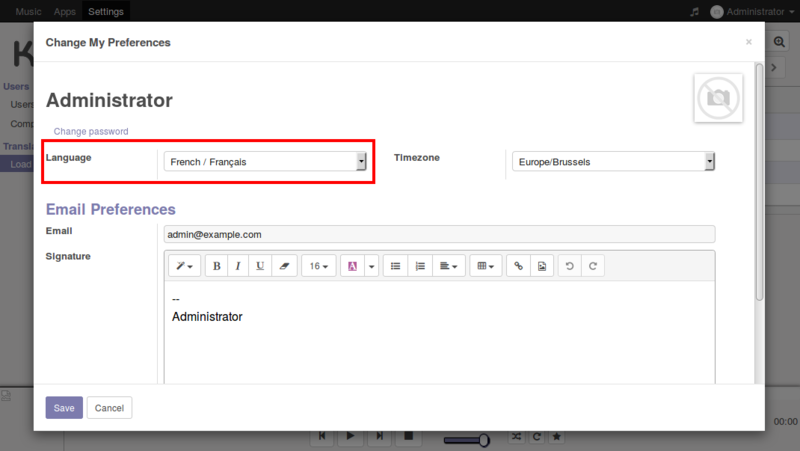 This is due to the fact that Odoo, the software on which relies KooZic, is completely translated in many languages. However, the music extension is not. As of today, only the French translation is available. Other translations can be added collaboratively on the POEdit project. Aside from the translations, improvements have been introduced in track sorting. To load a new translation, you must be connected as Administrator. Go to ‘Settings’, then ‘Load a Translation’. Select a language, then click on ‘Load’. The last step is to change the language in the user’s preferences. As said previously, it is possible to contribute to the translation on the corresponding POEdit project. At the moment, only French, German, Italian and Spanish are available. If necessary, I will add other languages. The track sorting has been enhanced to take into account a numbering like ‘1’, ‘2’, ‘3’ instead of ‘01’, ‘02’, ‘03’. Moreover, the artist of an album will be defined with the following logic: if the tag ‘Album Artist’ is filled in on the tracks, it is preferred. If it is not filled in, the tag ‘Artist’ is used. In ‘Configuration > Folders’, click on ‘Force Full Scan’. Note that the scan duration will be slightly longer than the initial scan, since a complete update of the library takes more time than creating it.